pseudoparanormal: Your poking my Qi! Acupuncture simply is the treatment of symptoms or illness through the strategic placement of small needles into the skin. This treatment began many centuries ago in the Far East. Today many people are unsure of the validity of the claims of acupuncture. One problem with acupuncture is the disagreement between schools of thought. The Eastern Explanation for how acupuncture works is that the life energy flowing through the body, known as Qi (pronounced chee) can be influenced and balanced by stimulating specific points on the body. These points are located along channels of energy known as meridians that connect all of our major organs. According to Chinese medical theory, illness arises when the cyclical flow of Qi in the meridians becomes unbalanced or is blocked. On the other hand the western definition of acupuncture is the stimulation of specific points located near or on the surface of the skin which have the ability to alter various biochemical and physiological conditions in order to achieve the desired effect. Really, how does acupuncture work? Acupuncture points are areas of designated electrical sensitivity. Inserting needles at these points stimulates various sensory receptors that, in turn, stimulate nerves that transmit impulses to the hypothalamic-pituitary system at the base of the brain, which is responsible for releasing neurotransmitters and endorphins, the body's natural pain-killing hormones. Acupuncture can be used for treating a myriad of symptoms and illnesses such as nausea and vomiting after chemotherapy, postoperative dental pain, addiction, stroke rehabilitation, headache, menstrual cramps, tennis elbow, fibromyalgia, myofascial pain, osteoarthritis, low-back pain, carpal tunnel syndrome, and asthma. The question at hand however is how this happens, and is it for real? In a German study of acupuncture for back pain, Dr. Heinz Endres studied 1,100 randomized patients with three treatment arms. The first received standard therapy; massage, anti-inflammatories, and heating pads. The second received acupuncture. 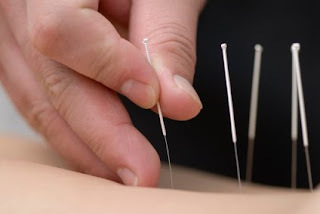 The third received sham acupuncture where the needles were inserted but not deeply, not manipulated, and were not in traditional acupuncture points. The study found 47% improvement in the acupuncture group, 44% in the sham acupuncture, and 27% in the standard therapy group after 6 months. The problem with acupuncture however is not just ambiguous results but difficulty in running scientifically sound studies at all. This being said acupuncture as in many other questionable or unproven medical treatments is continuing to be practiced around the world.